Leaked – Futaba 4PLS 2.4 GHz T-FHSS Transmitter with Telemetry « Big Squid RC – RC Car and Truck News, Reviews, Videos, and More! 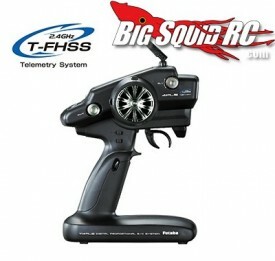 Ever since the Futaba 4PL was first introduced it has been a favorite of ours here at BigSquidRC. What was there not to like? It had tons of high-end features (and performance) at a working mans price point. Information has just been leaked on the new Futaba 4PLS. The 4PLS looks to come with a few upgrades over the older 4PL. For instance the 4PLS is set-up for use with telemetry and comes standard with a 2S LiFe battery. We’ll post more information on the 4PLS as we receive it, until then check out the official Futaba Website to take a look at some of their other fine products. Have you seen the durability testing video that we did on the Futaba 4PL? If not, you can see it HERE.